I only know because I've been collecting and reading the Warmaster magazines, a Colin Grayson sculpt, apparently. I will give one more day to submit the entries ad on second of August I will open the poll. Poll time will end on friday. This month I really enjoy expanding my WMAncient armies. I painted Old glory and Newline design. Qick paint, and no highlight nor inks, but I think with a very reasonable tabletop game finish. 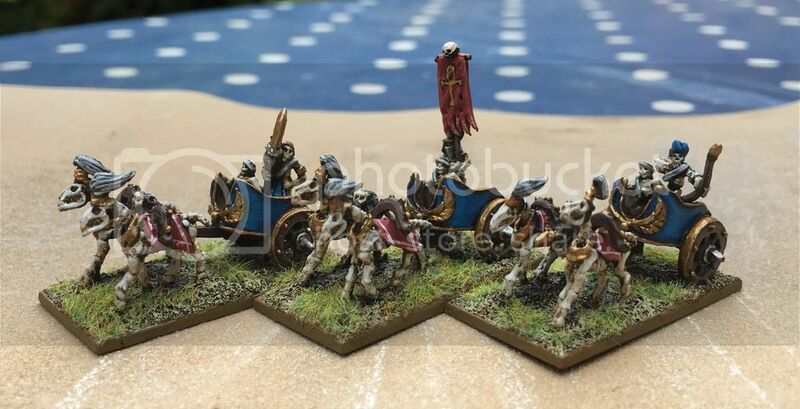 Loving the ancients, the Undead (banner in particular) and the siege. I sadly must wait with the dullcoat and finishing touches + basing but didnt want to skip this month too so here is my entry for the month. In other news we had ourselves a nice tournament with 5 participants at Aquahog's this weekend. Great fun! We tried out using chessclocks with a total of 1,5hours per player and I can really recommend it to keep gametimes at an ok length! Poll added, it will be open for 5 days. Everyone can vote, is not necessary to be part of the tale to be a judge. You could see the final picture in the search engine writting the word [ENTRY]. thanks to all participants and as much votes as much fun, sooo vote! Nice work everyone! Sadly I got too busy this month to finish my goal, but you all did excellent work! Agree! Lots of great work done this month Do we have anyone taking resonsibility for ToWP - August? Thank you to everyone who participate and also for voting. Congratulations to dry erease. You could add your pics to winners of wm tale forum and send me your postal adress in a pm. I will send you the kislev characters. Hope you enjoy them.